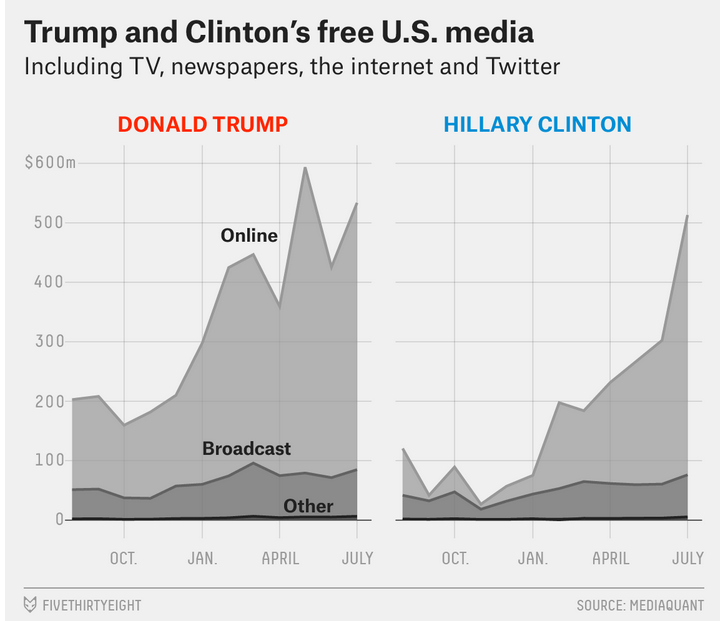 Hillary Clinton gets far less air time and far fewer column inches in mainstream media coverage than does Donald Trump. And while that’s a huge problem, it’s not the only evidence of lopsided coverage: The tone is out of balance, as well. Trump’s outrageous pronouncements, outright lies, and non-policies are frequently quoted as the “truth-telling” statements of a political outsider; while Clinton’s in-depth policy ideas and long record of public service are ignored, as right-wing manufactured non-scandals are highlighted, and she is portrayed as the dishonest politician. That inequality of coverage—especially in the way the media characterizes each candidate– is the subject of Paul Krugman’s column in the New York Times today. Krugman draws a parallel between this year’ media coverage and that of George W. Bush vs. Al Gore in 2000. And we all know how that ended. Krugman accuses the media of using many misleading, loaded words in its reporting about Clinton, but fewer of these same terms regarding Trump. . If reports about a candidate talk about how something “raises questions,” creates “shadows,” or anything similar, be aware that these are all too often weasel words used to create the impression of wrongdoing out of thin air.